Who loves the show Victoria? The Crown? 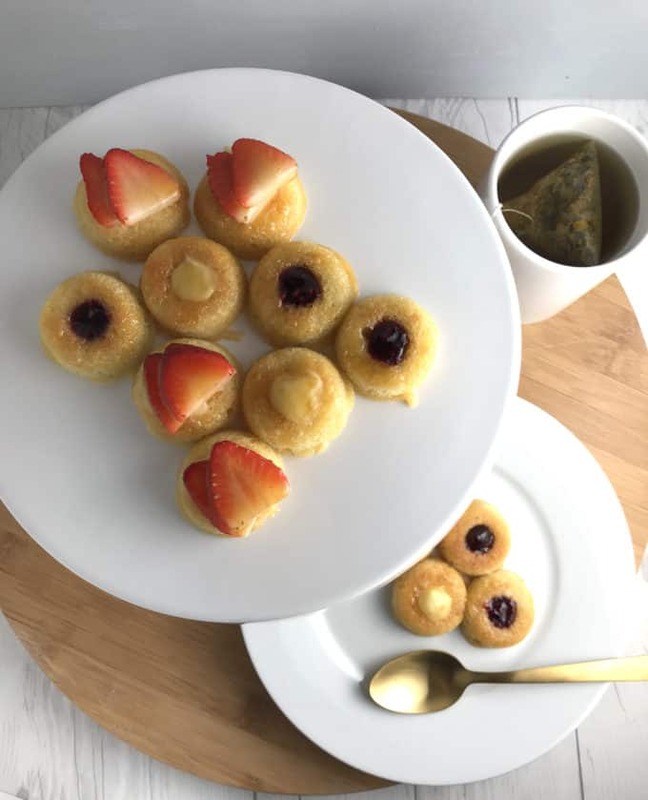 Make these easy Mini Victorian Tea Cakes the next time you watch! Oh my gosh! I just found out about these two shows, and I am hooked! Finally, some good television that isn’t a reality show. I also love history too, so everytime I am done watching I look to see if it happened or not. My husband and I also watch these shows together too. Well, last Monday night, some friends and I got together to watch the Season 2 Finale of Victoria, already I am not ready for a finale now. I thought of making some tea cakes to go along with the show, and these came out awesome! 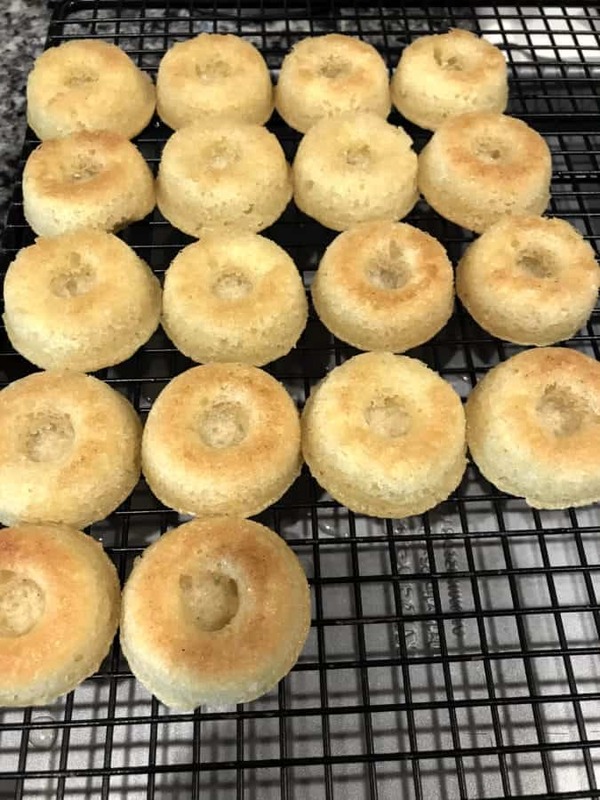 These tea cakes are similar to something that I used to make at a country club that I used to work for before our girls came along. 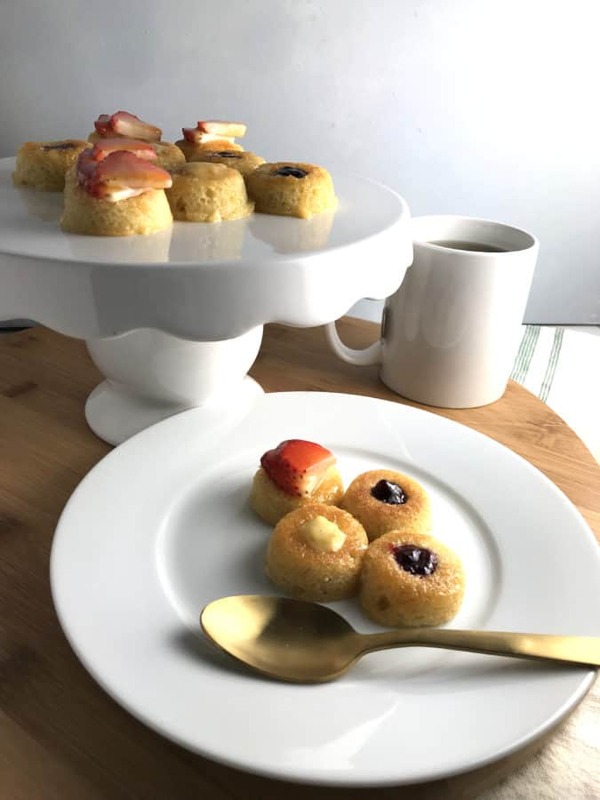 The cake is a light airy sponge cake filled with your filling of choice like your favorite jam, pastry cream, pastry cream topped with fresh fruit, or even chocolate ganache. The cakes are then glazed with an apricot jam, to help keep the cake moist and to give it shine. 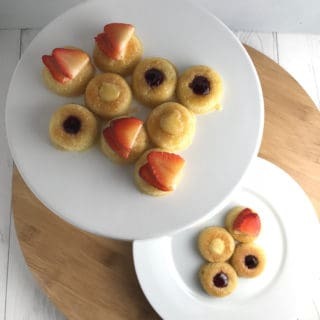 I brought these Mini Victoria Tea Cakes over for our viewing party and my friends and I enjoyed them as we watched the Season 2 Finale of Victoria. Mini Vanilla Sponge Cakes filled with your favorite filling and glazed with apricot jam. Sift flour and baking powder together. Fold dry ingredients with a whisk into the whipped eggs and sugar. Brush your mold with the coconut oil. In a small saucepan over medium heat, melt the apricot jam and water and simmer for five minutes. Strain through a sieve and reserve. Fill each cake with your favorite filling and glaze the cakes using a pastry brush. Mini is better right?! Thank you! Well now I am going to have to get me a baking pan so I can make these gems. Fill them with anything. Yep this one is a keeper. 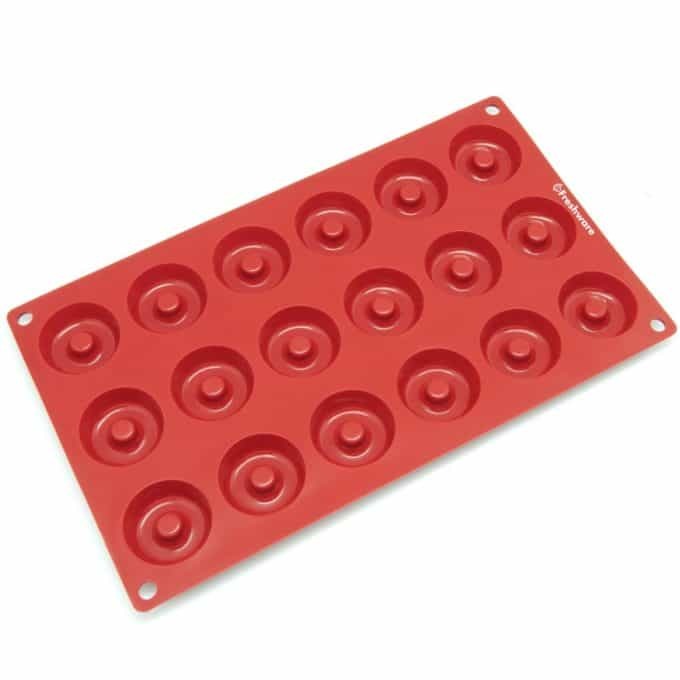 Best part is this baking pan is flexible for easy storage and thanks! These are absolutely adorable! Can’t wait to make them. These look amazing! I will definitely be making these with my boys for our poetry teatime. Aww, how awesome! Thank you! Those look amazing. I like that they are mimi size and I bet they taste as good as they look. Great post! Such a fun cute recipe. Love it. Can’t wait to try it. Such perfect tea party treats! I can’t wait to make these. Wow! These look delish! Ireally really would like to make these but I have to be good and maybe make them a bit healthier. But then again, it wont be as tasty. Oh gosh, what to do! Thanks you for the recipe and well maybe a few kilos to go with it to! LOL!!! Ive never head of the show but these look so delicious and cute!! Thanks for sharing ! These sound scrumptious! Perfect for a tea party. So cute! They look delicious. These are ridiculously cute! They make me want to have a tea party with my kids! Thank you, aww what an awesome idea! 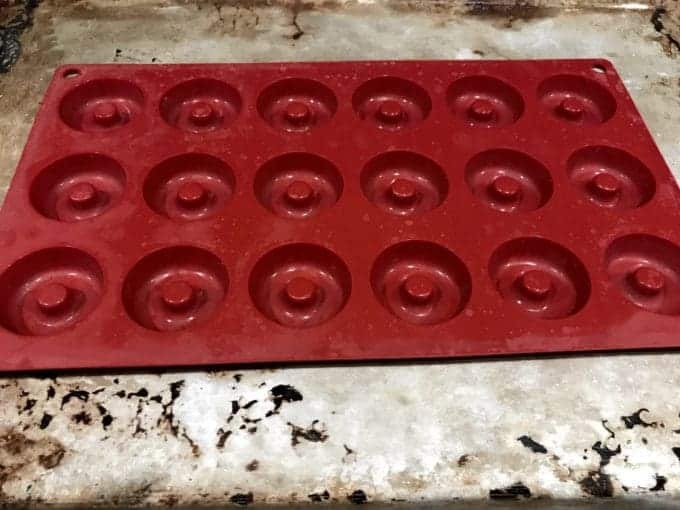 Such a great idea putting them in the little doughnut moulds! Those look so tasty!! I love how dainty they are too. These are adorable. Thanks for sharing the recipe. However, I am a little confused about the quantity of baking powder. It says 1/4 tsp & then below says TBSP baking powder. Could you clarify please? Thank you so much for stopping by. It is a 1/4 tsp of baking powder. Thank you so much.